Set against the backdrop of Fritz Haeg’s thought-provoking Domestic Integrities exhibition, Bucky Fuller Night was an evening of storytelling, discussion, and hands-on activities celebrating the life and work of R. Buckminster Fuller. 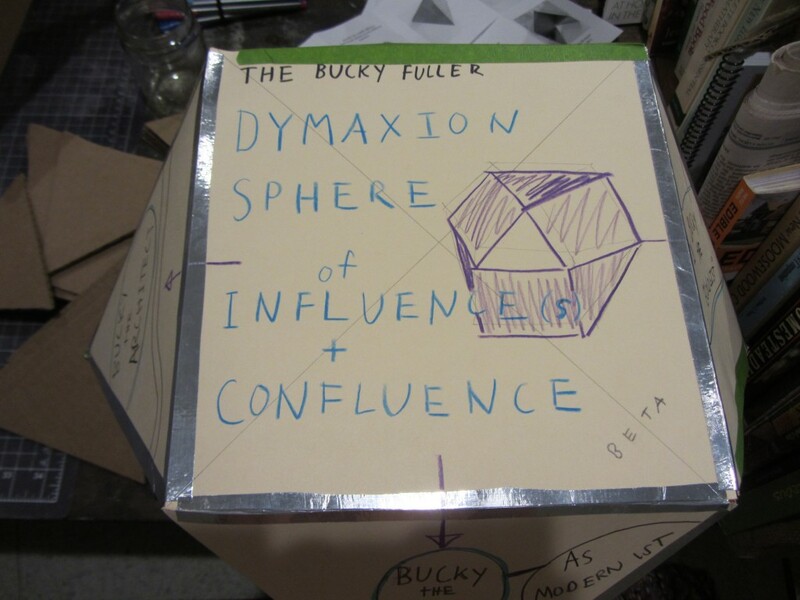 From mathematicians intrigued by his concept of synergetic geometry to linguists who appreciate his neologisms like “tensegrity,” “dymaxion,” and “omni-interaccomodative,” all kinds of Bucky fans had the chance to share and discover reasons to love the inventor-designer-thinker-futurist. The October 10 event served as a prelude to Sam Green and Yo La Tengo’s “live documentary” performance of Green’s film The Love Song of R. Buckminster Fuller at the Walker tonight. 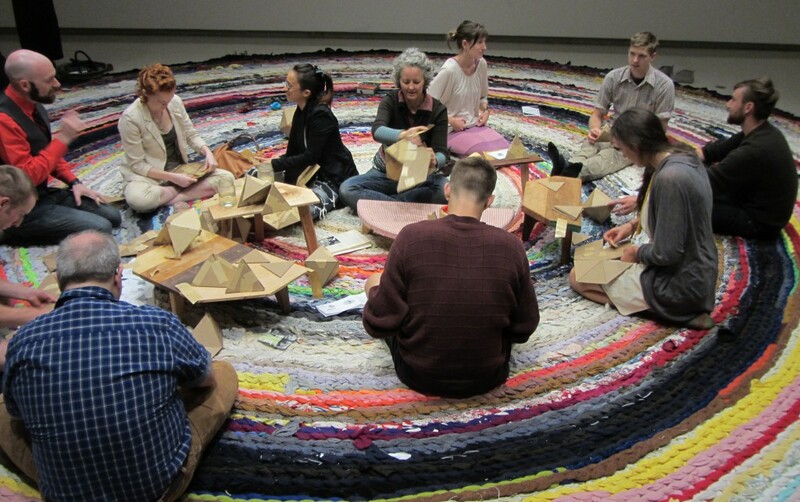 The night’s Bucky-centric discussion was casual and cozy, with speakers and guests settled on Fritz Haeg’s thirty-foot crocheted rug. Walker intern Will Gobeli kicked off the event by discussing Fuller’s influence on Haeg’s life and works. Haeg lives in Los Angeles in a geodesic dome — one of Fuller’s most well-known architectural inventions — and his Foraging Circle in the Minneapolis Sculpture Garden is also housed in a geodesic dome. With these connections drawn, Ashley Duffalo, public programs manager in the Education Department, then took us back in time with some anecdotes she found in her archival research about Bucky in Minnesota. Did you know, for example, that Bucky sat on the advisory board for an experimental city in northern Minnesota? Or that he built a geodesic greenhouse on the rooftop of the former Northwestern National Bank in Minneapolis, and spoke there about the importance of agricultural innovation? Ashley then passed the torch to Sam Green to talk about some of the reasons he loves Bucky. His film project began as a commission from the San Francisco Museum of Modern Art, which was curating an exhibition about Fuller. Green delved into research at the Stanford archives, which, given Bucky’s propensity to document every day of his life from 1920 to 1983, had more than enough information about the man. Given an in-depth look into Fuller’s everyday life, Green discussed some of the man’s personal quirks—such as his 5-hour non-stop “thinking out loud” lectures that always started with an uncomfortably long pause, and his talent for thinking up quirky titles for his books, like Operating Manual for Spaceship Earth and Utopia or Oblivion. “He was a great self-marketer,” Green affirmed, bringing up Bucky’s oft-mentioned habit of wearing three watches while he was traveling to correspond to the time zones of his past, present, and future locations. But Bucky may have been hyperbolizing a bit in order to create a legendary character for himself — Green joked that in all his archival research, he did not find a single picture of Buckminster Fuller wearing three watches. Of course, Green found more in Bucky to appreciate than just his personality quirks. What he admires most about R. Buckminster Fuller is his idea that the world has enough resources for everyone to live a comfortable life — if we can find a way to use them effectively. At the end of the formal discussion, more audience members shared stories of their recollections of Fuller. A few had been witness to his “thinking out loud lectures,” and came away laughing from his tendency for both awkward pauses and non-stop speaking but inspired by his ideas and his ways of thinking. One graduate of the University of Minnesota School of Architecture told a story of Bucky and the Dean of the School of Architecture writing a prognosis for the year 2000 and burying it in a bell jar at a Minnesota construction site. The evening ended with an opportunity to try out some of Bucky’s geometric design techniques using cardboard triangles, an activity led by artist Margaret Pezalla-Granlund. Fuller revealed his geometric genius early in life, creating in his kindergarten class an octet truss made of toothpicks and dried peas — a design which he eventually patented in 1961 (minus the peas, of course). Buckminster Fuller — an inventor, visionary, architect, futurist, mathematician, author, designer, and environmental activist, to name a few — defied categorization. Bucky Fuller Night similarly highlighted the dynamic potentials of “comprehensivism,” connecting the world of Fritz Haeg’s intellectual, interactive art (itself quite uncategorizable) to another collaborative project: Green and Yo La Tengo’s The Love Song of R. Buckminster Fuller. 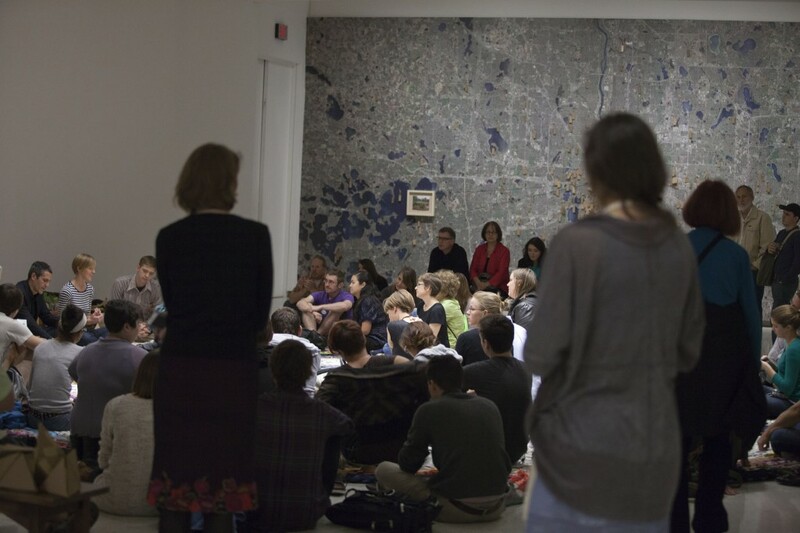 Described by Green as “a cross between a film, a piece of performance art, and a really fancy lecture,” the “live documentary” reflects the Walker’s ongoing commitment to interdisciplinary, collaborative — perhaps even comprehensivist — work. We think Bucky would be proud. Sam Green and Yo La Tengo present The Love Song of R. Buckminster Fuller on Friday, October 11 , 2013, at 7 and 9:30 pm in the McGuire Theater.